Simply put construction dust is the #1 nuisance issue for both contractors and clients. Eliminate 90% of airborne dust! The BuildClean Starter Kit is all that you need to start using the BuildClean system and it is an easy way for contractors to start their dust management program! 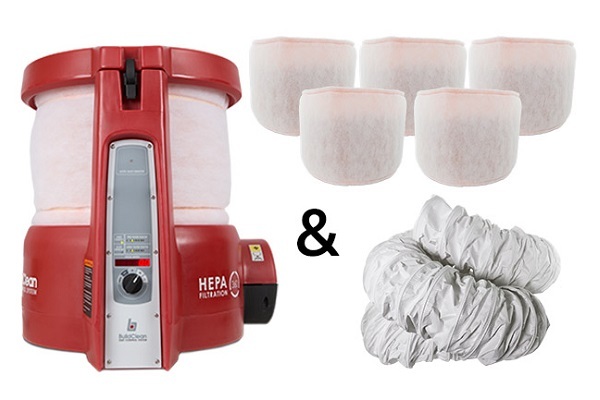 Rugged, portable, compact, and loaded with features the HEPA 360° Air Scrubber is ideal for contractors who need to control job site dust in a very effective and low cost manner. Easy to use—plug it in and turn it on. The machine uses a fan to draw in dirty air, passes it through a two stage filtration system, captures the dust, and returns the clean air into the room. From Anonymous of Windsor Locks, Connecticut on 8/21/2017 . The System works great which is why we purchased our second system. We feel now that after having one we simply should not do any type of demo of work in a dusty environment with out. Pretty remarkable air cleaning product! From Mike Gacek, LaMantia Design &amp; Construction of Chicago Metro, Illinois on 8/2/2017 . We always strive to do what is best for our customers throughout all phases of their remodel; keeping their homes (and air quality!) as safe and clean as possible is a top priority. These machines are easy to use, extremely powerful and make customers and work crews equally happy with the results. To date, we have 6 machines and plan to get more - it's a pretty remarkable air cleaning product! From Majestik Construction, of Corona, California on 7/28/2017 . We started using the BuildClean about 6 months ago, and have been nothing but amazed by how well it works. Customers love the fact that we offer a way to clean the air, while our workers love not having to breathe in all the dust and other pollutants a job site creates. Overall it was a great investment for my small construction business and a great marketing tool for residential customers. From Anonymous of Los Angeles, California on 6/30/2017 . From Kris of Atlanta, Georgia on 6/6/2017 . The system works well. There is significantly less dust on the jobsite - normally there is this light haze on the surrounding areas and it is either not there, or much less noticeable. From Anonymous of Los Angeles, California on 5/24/2017 . The BuildClean works great from a air cleaning perspective. I am very glad I spent the money. Everyone loves it. Its everything as advertised. From Anonymous of Detroit, Michigan on 5/2/2017 . This thing is a beast. I can't say enough good things about this amazing machine. From Anonymous of Portland, Oregon on 4/24/2017 . From Anonymous of Minneapolis, Minnesota on 4/20/2017 . From Ben of San Francisco, California on 3/30/2017 . I'm totally hooked on your product and would love to see it everywhere. From Sean of Mission Viejo, California on 2/24/2017 . From Anonymous of DC Area, Virginia on 2/2/2017 . We used the buildclean today while wet cutting a concrete footer inside a house. Very impressed. Worked well and I did not see any dust outside the envelope we created. The prefilter shows that it really sucked up the dust especially during the initial touch and removal of the saw from the concrete. From Doug of Swedesboro, New Jersey on 1/26/2017 . The only thing I can say is I should have made the investment sooner. From Anonymous of Winston Salem, North Carolina on 1/5/2017 . From Anonymous of Mentor, Ohio on 1/4/2017 . It's working well in the field. Needless to say that I'm a happy camper right now. From Anonymous of Grand Rapids, Michigan on 12/3/2016 . It's been working great! Lots of demo, little dust, breathable air! Just what I and my customers hoped for. From R3 Maintenance and Construction of Oceanside, California on 11/18/2016 . I have been using your BuildClean system for a few weeks now and am In love! It is amazing how well it works and how much time I save cleaning up after a project. From Medford Remodeling of Arlington, Texas on 11/10/2016 . We started using the BuildClean system about two months ago. Our team has noticed a huge difference at the jobsites! The system is great with eliminating dust and fumes and provides noticeably cleaner air and work space -- especially in smaller spaces (like a bathroom, or kitchen remodel). It's also great for large spaces (like a whole house remodel) if there are more than 1 BuildClean units being used. The customer service is great, too. Our clients are happy, our workers are happy; money well spent! Thank you, BuildClean! From MD Haney &amp; Co. of McMinnville, Oregon on 10/28/2016 . From Leo Lantz Construction, Inc. of Glen Allen, Virginia on 10/24/2016 . We use the BuildClean System as part of our comprehensive dust control plan for the benefit of our clients and construction professionals. It has vastly improved the air quality of our working environment. Thank you BuildClean! From Billy of Bent Mountain, Virginia on 9/22/2016 . I invested in using the BuildClean system because I am remodeling in high end homes and the number one comment I get is about dust and keeping site clean. Since using their system, I've gotten great feedback not only about cleanliness of site but also about my attention to this area. My attention to treating their home as if it was mine shows we care. From Anonymous of Fort Myers, Florida on 9/1/2016 . Happy with and using the system daily. I Have the flyers that I use in our leave behind packages. Have plans to get info up on our web site. EVENTUALLY! From D Mac of Parker, Colorado on 8/28/2016 . The unit performs very well....not 100% dustless.....as we make a mess. Just purchased my 2nd unit! From Gregory Rocha, ROCHA &amp; SON CONSTRUCTION of El Granada, California on 8/26/2016 . Just purchased my 2nd unit! Very happy with the 1st! From Andy of Chicago, Illinois on 7/28/2016 . From Martha Bizzell, Operations Manager, CROSS of San Antonio, Texas on 6/10/2016 . Great feedback on the BuildClean dust control system machine from job #1. Used it non-stop, it did it’s job (scary the amount of dust that came off of the filters – YUCK). From Anonymous of New Canaan, Connecticut on 5/26/2016 . We used the system in several phases of our latest project (2500 sf addition to a 1789 farmhouse that the family was still living in) and it worked like a charm. If nothing else, it gave the family a sense of security that my team and I were doing as much as we possibly can to make sure they were taken care of. It handled the sheetrock and superfine floor dust with ease. From Oliver Construction of Crystal Lake, Illinois on 5/19/2016 . Our crew is enjoying breathing clean air and so are our customers. The unit came very quickly, about 48 after ordering. We are pleased with the product! From Bryce of Rapid City, South Dakota on 4/11/2016 . We use the Build Clean system almost daily, out of all the tools I have purchased in the last couple of years yours has been my best investment we love it. We always put up plastic barrier walls around our work area but this took it a step further, it saves us time cleaning at the end of the day and the homeowners are impressed with how clean their home is when we are done. From Anonymous of Leesville, Louisiana on 3/25/2016 . I have used it on every interior job I have had since my company started in October and every client and my final clean team have all commented on how clean the job site is. 8/11/2017 – Can the pre-filters be cleaned for re-use? Response From BuildClean Dust Control System: Thank you for your question - One pre-filter should last one job (30 days), they are shaken out when dirty - you can do this multiple times over the course of a project. To avoid any liability issues, a new pre-filter should be used at the start of every job. The HEPA filter, should last 2,000 to 5,000 hours (depending on the type of dust and how well the pre-filters are maintained). 6/10/2016 – Do you have system training video? Specifications Please see individual product pages for specification information. Welcome to the BuildClean website operated by Illinois Tool Works Inc. (“ITW”). This website (the “BuildClean Website”) provides information about the BuildClean Dust Control System that was developed by ITW’s Renovation and Remodeling Group . Specifically, you agree not to do any of the following: (1) upload to or transmit on the BuildClean Website any defamatory, indecent, obscene, harassing, violent or otherwise objectionable material, or any material that is, or may be, protected by copyright, without permission from the copyright owner; (2) use the BuildClean Website to violate the legal rights (including the rights of publicity and privacy) of others or to violate the laws of any jurisdiction; (3) intercept or attempt to intercept electronic mail not intended for you; (4) misrepresent an affiliation with any person or organization; (5) upload to or transmit on the BuildClean Website any advertisements or solicitations of business; (6) restrict or inhibit use of the BuildClean Website by others; (7) upload or otherwise transmit files that contain a virus or corrupted data; (8) collect information about others (including e-mail addresses) without their consent; (9) download a file or software or include in a message any software, files or links that you know, or have reason to believe, cannot be distributed legally over the BuildClean Website or that you have a contractual obligation to keep confidential (notwithstanding its availability on the BuildClean Website); (10) post “spam,” transmit chain letters or engage in other similar activities; or (11) engage in any other conduct that restricts or inhibits anyone’s use or enjoyment of the BuildClean Website, or which, as determined by ITW, may harm ITW or users of the BuildClean Website or expose them to liability. ITW reserves the right, but does not assume any responsibility, to terminate any user’s access to all or part of the BuildClean Website. ITW assumes no liability for any action or inaction regarding transmissions, communications or content provided by third parties. ITW reserves the right to take any action it deems necessary to protect the personal safety of users of the BuildClean Website and the public; however, ITW has no liability or responsibility to anyone for performance or nonperformance of the activities described in this paragraph. Your failure to comply with the provisions of (a) or (b) above may result in the termination of your access to the BuildClean Website and may expose you to civil and/or criminal liability. The entire contents of the BuildClean Website (including all information, software, text, displays, images and audio) and the design, selection and arrangement thereof, are proprietary to ITW or its licensors and are protected by United States and international laws regarding copyrights, trademarks, trade secrets and other proprietary rights. You are authorized only to use the content on the BuildClean Website for personal use or legitimate business purposes related to your role as a current or prospective customer of ITW. You may not copy, modify, create derivative works of, publicly display or perform, republish, store, transmit or distribute any of the material on the BuildClean Website without the prior written consent of ITW, except to: (a) store copies of such materials temporarily in RAM, (b) store files that are automatically cached by your web browser for display enhancement purposes, and (c) print a reasonable number of pages of the BuildClean Website; provided in each case that you do not alter or remove any copyright or other proprietary notices included in such materials. Neither the title nor any intellectual property rights to any information or material in the BuildClean Website are transferred to you, but remain with ITW or the applicable owner of such content. Except as expressly authorized by ITW in writing, you may not reproduce, sell or exploit for any commercial purposes (i) any part of the BuildClean Website, (ii) access to the BuildClean Website, or (iii) use of the BuildClean Website or of any products, services or materials available through the BuildClean Website. The terms “ITW” and “BuildClean” are trademarks and the ITW and BuildClean logo and all related product and service names, designs and slogans are trademarks of ITW. You may not use such marks without ITW’s prior written permission. All other names, brands and marks are used for identification purposes only and may be trademarks or registered trademarks of their respective owners. ITW does not assume any liability for the materials, information and opinions provided on, or available through, the BuildClean Website (the “Site Content”). Reliance on the Site Content is solely at your own risk. ITW disclaims any liability for injury or damages resulting from the use of any Site Content. THE BUILDCLEAN WEBSITE AND THE SITE CONTENT PROVIDED ON OR AVAILABLE THROUGH THE BUILDCLEAN WEBSITE ARE PROVIDED ON AN “AS IS” AND “AS AVAILABLE” BASIS, WITH ALL FAULTS. NEITHER ITW NOR ANY PERSON ASSOCIATED WITH ITW MAKES ANY WARRANTY OR REPRESENTATION WITH RESPECT TO THE QUALITY, ACCURACY OR AVAILABILITY OF THE BUILDCLEAN WEBSITE. SPECIFICALLY, BUT WITHOUT LIMITING THE FOREGOING, NEITHER ITW NOR ANYONE ASSOCIATED WITH ITW WARRANTS OR REPRESENTS THAT THE BUILDCLEAN WEBSITE OR THE SITE CONTENT PROVIDED ON OR THROUGH THE BUILDCLEAN WEBSITE WILL BE ACCURATE, RELIABLE, ERROR-FREE OR UNINTERRUPTED; THAT DEFECTS WILL BE CORRECTED; THAT THE BUILDCLEAN WEBSITE OR THE SERVER THAT MAKES IT AVAILABLE ARE FREE OF VIRUSES OR OTHER HARMFUL COMPONENTS; OR THAT THE BUILDCREAN WEBSITE WILL OTHERWISE MEET YOUR NEEDS OR EXPECTATIONS. ITW DISCLAIMS ALL WARRANTIES OF ANY KIND, EXPRESS OR IMPLIED, INCLUDING ANY WARRANTIES OF MERCHANTABILITY, FITNESS FOR A PARTICULAR PURPOSE OR NON-INFRINGEMENT. IN NO EVENT WILL ITW OR ITS LICENSORS OR CONTRACTORS BE LIABLE FOR ANY DAMAGES OF ANY KIND, UNDER ANY LEGAL THEORY, ARISING OUT OF OR IN CONNECTION WITH YOUR USE OF, OR INABILITY TO USE, THE BUILDCLEAN WEBSITE OR THE SITE CONTENT PROVIDED ON OR THROUGH THE BUILDCLEAN WEBSITE OR ANY LINKED SITE, INCLUDING ANY DIRECT, INDIRECT, INCIDENTAL, SPECIAL, CONSEQUENTIAL OR PUNITIVE DAMAGES, INCLUDING, BUT NOT LIMITED TO, PERSONAL INJURY, LOST PROFITS OR DAMAGES RESULTING FROM DELAY, INTERRUPTION IN SERVICE, VIRUSES, DELETION OF FILES OR ELECTRONIC COMMUNICATIONS, OR ERRORS, OMISSIONS OR OTHER INACCURACIES IN THE BUILDCLEAN WEBSITE OR THE SITE CONTENT, WHETHER OR NOT THERE IS NEGLIGENCE BY ITW AND WHETHER OR NOT ITW HAS BEEN ADVISED OF THE POSSIBILITY OF ANY SUCH DAMAGES. The BuildClean Website may contain links to other websites on the Internet. ITW is not responsible for and does not endorse the content, products or services of any third-party websites, including, without limitation, sites framed within the BuildClean Website or third-party advertisements, and ITW does not make any representations regarding their quality, content or accuracy. Your use of third-party websites is at your own risk and subject to the terms and conditions of use for such websites. The owner of the BuildClean Website, ITW, is headquartered in the State of Illinois, USA. ITW makes no representation that the Site Content or information available via the BuildClean Website is appropriate or available for use in jurisdictions outside of the United States. If you access the BuildClean Website from other jurisdictions, you are responsible for complying with the local laws of such jurisdictions. Like many other web sites, we actively collect information from our visitors by allowing users to submit contact information. Some of the information that you submit may be personally identifiable (that is, information that can be uniquely identified with you, such as your name, e-mail address, phone number, etc.). When you visit the BuildClean Website, we will not collect any personally identifiable information about you unless you provide it to us voluntarily. ITW uses this information for the purposes for which you provide it. take appropriate measures, by contract or otherwise, to provide adequate protection for personal information that is disclosed to a third party or transferred to another country, including transfers within ITW. ITW retains the personal information collected via the BuildClean Website as long as necessary to provide the products, services and information you request or as permitted by applicable law. or in situations involving threats of physical safety of any person. We do not otherwise distribute to third parties your personally identifiable information. However, we will have no liability for disclosure of information obtained due to errors in transmission or the unauthorized intervention of third parties. We strive to provide you with as many choices and as much control as possible regarding the personal information you provide to us. We have created mechanisms to provide you with the following control over your information: You may also send us an e-mail message at buildclean@itwbrands.com to request access to, correct or delete any personal information that you have provided to us. To protect your privacy, we will only respond to e-mail messages sent from the e-mail account you submitted to the BuildClean Website. Should you elect to have your information deleted, we will also delete any record of your information. We work hard to protect your personal information. ITW will not sell personal information collected from the BuildClean Website to mailing list brokers without your express consent. All information is stored within a secured database that is not accessible to the outside world. All ITW servers are protected behind both hardware and software firewalls. Low-level access to all information is restricted to authorized support personnel only. The BuildClean Website is not intended for children under the age of 13. We will not knowingly collect information from BuildClean Website visitors in this age group. We encourage parents to talk to their children about their use of the Internet and the information they disclose online. If your child has submitted personal information and you would like to request that such information be deleted from our records, you may do so by using the feedback mechanisms provided at the BuildClean Website, by clicking on the Contact Us link or by writing us at the address set forth in Section 5 below. The BuildClean Dust Control System is sold with a satisfaction guarantee. Within the first 30 days of use, if the system is not dramatically reducing the amount of airborne dust, we'll refund 100% of the purchase upon the return of the unit.